A Queensland worm farmer believes she has invented the world’s first commercially-produced solar powered compost machine. 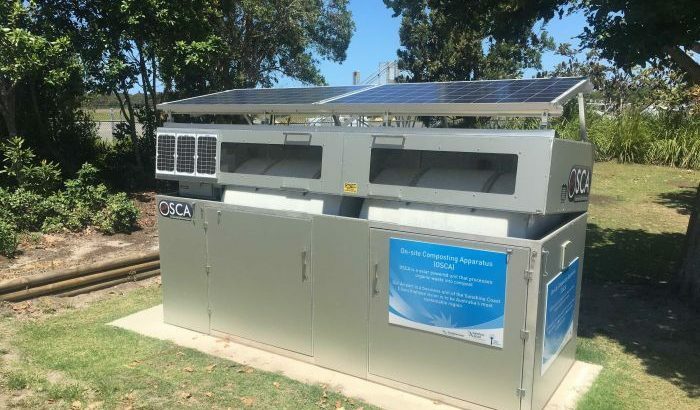 “It certainly is, yes, and we are happy to say it has been designed here in Australia and running entirely on solar,” said Penny Mitchell, from Palmwoods on the Sunshine Coast. Waste material is put into two bins that rotate with the power of the sun, breaking down the matter with time. Ms Mitchell said the market for solar powered compost bins was environmentally conscious businesses that wanted to reduce their carbon footprint. “We are getting quite a bit of interest, we have had enquiries from [companies in] India and New Zealand and a few other places,” she said. “Sunshine Coast Airport has treated 14,500 litres of waste so far and turned into compost to be used on the gardens surrounding the airport. “We have actually reduced significantly the amounts of trucks we have going to landfall and we have had to double the amount of trucks going to the recycle depo,” Mr Pallott said. Brown cardboard newspaper debate for feeding earthworms and composting, Glue or soaks up other organic stuff, Leaves better?